The Orange King, possibly a direct lineal descendant of the Sun King, is certain that 3 or 4 million voted illegally for Hillary, relying on the work of someone called Greg Phillips who purports to have the names of 3 million people who voted illegally in the last election. Phillips was questioned by Andrew Cuomo about his findings. Possible source of Trump's mass voter fraud claim says proof is on the way - CNNPolitics.com I would recommend viewing that interview after putting your ideology in your pocket and viewing this cross examination as you would as a juror during trial. Is Phillips remotely credible? He is just a guy, who worked in the 1980s and 1990s in the Mississippi and Alabama republican parties who has an organization somewhere called VoteStand. Maybe that is an just an APP that can be downloaded by disgruntled white men who discover illegal voting by non-white people at elections. He has been making this claim, which Trump accepts as true, without providing anyone with proof.
" No matter what Obama or anyone else says, the only entity that hacked election systems was Obama's Department of Homeland Security." "The most tyrannical result of Obama's eight years was weaponization of Government against the people." Birds of a feather flock together? I will answer that one. Yes they do. I can see why the Orange King finds him so appealing and trustworthy. I would also recommend reading the transcript of David Muir's interview with Trump. "DAVID MUIR: Do you think that that talking about millions of illegal votes is dangerous to this country without presenting the evidence? PRESIDENT TRUMP: According to Pew report, then he's -- then he's groveling again. You know, I always talk about the reporters that grovel when they wanna write something that you wanna hear but not necessarily millions of people wanna hear or have to hear." Trump is certain that (1) three to five million votes were cast illegally; (2) everyone one of those votes went to Hillary; and (3) the author of the Pew report has changed his tune and is now groveling again. By the way, among the people registered in two states are Steve Bannon (Trump's close advisor), Trump's son-in-law Jared Kushner (Chief Guru), Trump's Press Secretary (the Alternate Fact Guy) and Trump's daughter Tiffany. Trump is certain that every single person who is registered in two states voted for Hillary. Proof is no longer necessary before a U.S. President makes that kind of statement. Perhaps his investigation into voting fraud needs to dig deep into whether or not his inner circle are sleeper agents of the vast Left-Wing Creeping Socialism Conspiracy by voting for Hillary. What does this tell you about Trump? Does it suggest that he is even capable of exercising good judgment after gathering the facts or is he perpetually engaged in his own reality creations? Again, look at it as a juror performing their duty to reach the right verdict. The Houston Chronicle has an interesting story about Mr. Phillips, Trump's voting fraud source, that was published in 2005. And now we have Jeff Sessions, who has already reached the same conclusion as Trump without any evidence (remember-no longer required), leading an inquiry into voter fraud demanded by Trump because he lost the popular vote and he will not accept it. 2016 National Popular Vote Tracker (Final) We can all rest assured that Jeff Sessions has our back and will go that extra mile to protect and defend civil and constitutional rights. Can't we? There is certainly reason for True Conservatives, the antithesis of the Modern Day GOP, to be concerned that this "investigation" is merely a pretext for GOP controlled states to pass more restrictive voter laws in order to suppress non-whites from voting. When Trump and other GOP tribe members identify where this massive voting fraud occurs, needless to say they omit any reference to white rural America, overwhelmingly filled with the 62.979+M Trump voters, but refer only to geographic areas where there are high concentrations of non-white voters. I just call balls and strikes as I see them and others can draw their own conclusions. IMO, the evidence supports only one conclusion. For a long time now, the GOP has been engaged in a transparent attempt to undermine and discredit institutions essential for the proper functioning of a Democracy in order to acquire and maintain political power. Trump has simply increased those efforts in a more transparent and obvious way. Undermine the truth=Undermine Democracy. That should be Trump's slogan rather than Make America Great Again. Almost 63M adults voted for Trump and they knew exactly what kind of man they were putting in the Oval Office. Trump never tried to obfuscate who he was, like so many other politicians, and he is doing now and will continue to do what most, if not all of those 63M voters wanted him to do. The Tennessee GOP tribe members were up in arms a few years back when the Republican Governor Haslam hired for God's Sake One of Those Muslims trying to bring Sharia Law to Tennessee. Now don't get on me for that sentence. I am only a messenger here. Yes, that republican traitor hired a young lady by the name of Samar Ali, who was born in the middle of nowhere Waverly, TN and graduated with honors from Vanderbilt and its law school, as the international director in Tennessee's Economic Development Department. Ms. Ali is now an attorney with the blue blood and white shoe Nashville law firm of Bass, Berry & Sims and had worked as a White House Fellow to assist in the fight against ISIS. The following linked article, published in the Nashville Scene, which quotes statements made by GOP tribe members, is instructive on their "thought" process: How Do You Solve a Problem Like Shari ... Look Out It's Behind You! "Tennessee Governor Bill Haslam has elevated and/or afford [sic] preferential political status to Sharia adherents in Tennessee, thereby aiding and abetting the advancement of an ideology and doctrine which is wholly incompatible with the Constitution of the United States and the Tennessee Constitution,"
I am not making this up. Perhaps they need a grade school student to write their resolutions from now on. To make matters far worse, the Governor had also hired one of Them Homosexuals too. Trump fits right into this mind set. And, I am not referring to the mind set of Tennessee's Governor. Immigration EO and the Vetting Process: Try Waterboarding Immigrants? What I find interesting is that Saudi Arabia is not on that list. My memory is a bit foggy at times, but I can still remember that most of the 9/11 hijackers were from Saudi Arabia (15). The others were from Egypt (1), Lebanon (1) and the United Arab Emirates (2) who are not among those 7 countries either. I don't want to be a stickler here, but Bin Laden, the guy who put that plan in motion, was a rich Saudi, and there is some evidence that other powerful Saudis supported the attack. Just forget about that I suppose. Trump's EO on immigrations has the look of a law passed by the House and Senate and then signed by our Great Leader. Alas, that is no longer necessary. Donald knows what is best for the country and over 62M U.S. citizens support him. Right Brain wanted to know what new measures are included in the GOP's new extreme vetting process that will identify those radical Islamic Terrorists. Since Trump likes torture and approves of waterboarding (torture is an approved core GOP conservative value now), maybe his solution will be for the U.S. to waterboard every refugee seeking entry into the U.S. until we get the truth out of them. The CIA can tell them that we will stop the waterboarding when they admit to being a terrorist. That will prove that waterboarding works as a screening tool. My suggestion is that the refugees might want to reconsider their requests for entry into the Land of the Free and just go to Canada or some other civilized nation where Reality Creations and Fear Mongering by Demagogues are not the Soup Du Jour. After reading that article in the Times about Syrian refugees in Canada, I can understand why 41% of Americans want a wall built along the border with Canada. What they have not heard -yet -is that the GOP will want Canada to pay for it. I am sure glad that the drug flow into this country will soon end. Personally I do not use any, nor do I even drink alcoholic beverages. But those white drug users who voted for Donald might think twice about doing it again. You don't want to piss off too many white voters, which is my advice to the GOP. "(e) Notwithstanding the temporary suspension imposed pursuant to subsection (a) of this section, the Secretaries of State and Homeland Security may jointly determine to admit individuals to the United States as refugees on a case-by-case basis, in their discretion, but only so long as they determine that the admission of such individuals as refugees is in the national interest -- including when the person is a religious minority in his country of nationality facing religious persecution, when admitting the person would enable the United States to conform its conduct to a preexisting international agreement, or when the person is already in transit and denying admission would cause undue hardship -- and it would not pose a risk to the security or welfare of the United States." Question: Are Christians a religious minority in Muslim nations? I was wondering, though, whether we can ship our home grown terrorists to Syria. The KKK and the American Nazi Party now have a strong voice in the White House that talks to the President daily. But that started me wondering some more. Are White Nationalists that murder and terrorize U.S. citizens terrorists? I was under the impression that they were, but I am not into the latest "conservative" thoughts on these issues. White Nationalists, Racists, Sexists and Neo-Nazis are now "conservatives" apparently. I must have slept through their conversion and rebranding process, sort of a sleep that lasted twice as long as Washington Irving's Rip Van Wrinkle's somnolence. I did read over the weekend a report that the woman who accused a 14 year African American child, Emmett Till, of touching her (a capital offense), admitted that she lied. Emmett was taken from his home, some liberals would call that kidnapping, and beaten to death. His mother wanted the world to see what was done to her child and photos of the result can be found in numerous places. Are those White Men terrorists? How about that Dylann Roof and countless others? There is certainly no shortage of home grown terrorists in the U.S. The following sample of articles proves once again why America needs to get rid of the lying free press. I am just trying to channel the new Groupthink and Newspeak now. I may need some practice, but I am 100% certain that I will be fluent in Newspeak within 4 years. No one should be allowed to write the following linked stories about our President and his Chief Advisor. So let's just shut the press down. Everyone had enough already? It's the only alternative left to salvage our freedoms. Did I say that right. Yes, that looks about right. Might as well shut down the courts infested with liberal lice as well starting with the judge who stayed Steve Bannon's EO. I meant to say Donald's EO. Was he a Mexican? That Press Secretary, what's his name, can tell us all we need to know from now on. Isn't he a trustworthy guy? Freedom from being a responsible and informed citizen will be so refreshing for everyone. I am already feeling better. What a load has been lifted off my shoulders. More examples, if more are needed, supporting a law requiring journalists to keep their mouths shut. We can dispense with Congress passing a law. Steve Bannon can write it for us, save time and money. My thinking is that we need to allow Steve Bannon and Stephen Miller to write all legislation for the country and to publish them as Executive Orders or just S & S Orders (or just shorten it to SS), rather than leaving it up to those politicians in Congress who can still give an advisory vote up or down. To be frank about this, I suspect that more than a few Trump white male voters (few defined here in terms of millions) would express the same thoughts as Miller in the Locker Room, where their wives can't hear them talk about what is really in their minds including their many conquests that would make the Donald so proud of them. Enterprise sold a 4.75% fixed-to-floating rate subordinated note a few weeks ago. The fixed coupon rate lasts until 11/1/2021. Enterprise may call on or after that date. Unless redeemed early at the issuer's option, the notes mature on 11/1/2026. The floating rate which starts on 11/1/21 is 338.7 basis points (3.387%) above the 3 month Libor rate. Bond Detail It is standard for a U.S. issuer to have the option to redeem when the security transitions from a fixed coupon to a floating rate and thereafter at its option. I do not expect an increase in the federal funds rate at the October 31st meeting, but do anticipate one in December 2017 and another in July 2017 or earlier. I currently view two .25% hikes as the most likely scenario for 2017, with three hikes being more likely than just one. I am clustering the maturities accordingly with that future forecast. All of my CD purchases fall under FDIC insurance. Nonetheless, I still view the bank's solvency to be the first line of defense and would not want to rely on the FDIC fallback ever. I do not currently own the common stock viewing it to be too richly at 22.8 times TTM GAAP earnings based on a closing price of $33.95. I have also owned HBAN in the past but have sold out of my position. It looks like this ladder is heading toward $300K. FINRA does not show the S & P rating for Statoil's senior unsecured debt. The preceding snapshot shows that S & P has assigned a A+ rating with Moody's at Aa3. The snapshot shows a 1.156% current yield and a 1.573% YTM. There is not much of a spread between my total cost and par value, but there is also not that much time until par value is paid. YTM takes both into account. I am building up a maturity cluster in the May-July 2018 time frame. So far, I have the following short term bonds and CDs maturing in that time frame. I will add some fillers to that list in both June and July but not in May. This type of security provides a measure of low inflation/deflation and problematic inflation in the same security. The security addresses the problematic inflation scenario through the 3 month Libor float provision. The low inflation/deflation scenario is addressed through the minimum coupon. It is the type of security that I will buy opportunistically and trade. I started to buy this type of security in 2008. None of the ones that I have owned have increased their coupons above the minimum rate due to the low Libor rates. That may be about to change. PYT makes quarterly interest payments at the greater of a 3% coupon or .85% above the 3 month Libor rate applied to a $25 par value. There is a maximum coupon of 8%. The underlying bond owned by the Grantor Trust is a Goldman Sachs 6.345% junior bond (a trust preferred) that matures on 2/15/34. That bond has a $1K par value and trades in the bond market. The owner of PYT is exposed to the underlying bond's credit risk as the beneficial owner of that bond through the PYT Grantor Trust. If GS pulls a Lehman, I can tell you now what the value of a GS junior bond will be in bankruptcy-zero and PYT would be a zero as well. In that kind of scenario, senior unsecured bond owners would probably be fortunate to recover 20 to 25 cents on the dollar. The common, equity preferred and junior bond owners will see their money again in either Money Hell or Money Heaven, as the case may be. On the day of my PYT purchase, the underlying bond closed at $119.58 creating at that price a yield-to-maturity of about 4.89% using the Morningstar Bond Calculator. For some reason, FINRA does not provide the YTM information. The current yield would be about 5.3% at a total cost of $119.58. The PYT trustee receives the interest payments from Goldman Sachs and swaps that payment with the swap counterparty, the brokerage company who created the Grantor Trust, for the payment due the owners of PYT. This Trust Certificate is scheduled to mature on that same date. Assuming GS pays the trustee the principal amount, the trustee will then redeem the trust certificates at their $25 par value. Snapshots of round trip synthetic floater trades can be found in Stocks, Bonds & Politics: Trust Certificates: New Gateway Post. Last Friday, I sold $3k of the Vanguard Equity Income Fund Admiral Class, which was my 4th $3k pare of that fund during the post election rally. The closing price was $69.25. This CEF has a managed minimum distribution policy that results in "quarterly distributions at an annual rate of 7% of the average of the prior four quarter-end net asset values." Distributions and Dividends - The Royce Funds Most of those dividends will be sourced from capital gains distributions. In the past, when unrealized gains evaporate as was the case during the Near Depression period, the Board will suspend the managed distribution policy rather than source dividends out of capital ("ROC" = Return of Capital), which is the right thing to do IMO. I periodically buy and then eliminate this CEF. I re-initiated a position thereafter and started to pare that position in 2016. I have had better luck with the Royce Micro Cap Fund (RMT) over the years. Total Return = $75.96 or 7.21% with about a 2 month holding period. This one is never a long term hold. Just look at the sell price numbers from past trades which I felt a need to color red and place in bold type face. The word "subordinated" means lower in the capital structure than senior unsecured debt. In other words, subordinated in this context means a junior bond that is superior in the capital structure only to common stock and equity preferred stock. 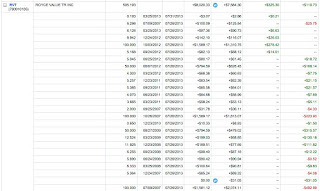 The remaining 16 THGA shares in this account were bought at $24.32 in a partial fill of a 50 share limit order. I will not be selling those shares anytime soon. Instead, I will simply wait for a better price, preferably below $22, to buy back the 50 shares sold at $25.36. I currently own 116 shares (16 left in the IB taxable account/50 in Roth IRA/50 Schwab Taxable bought with commission free trade). Of those 116 remaining shares, I own 50 in a ROTH IRA where this 6.35% coupon bond becomes tax free. 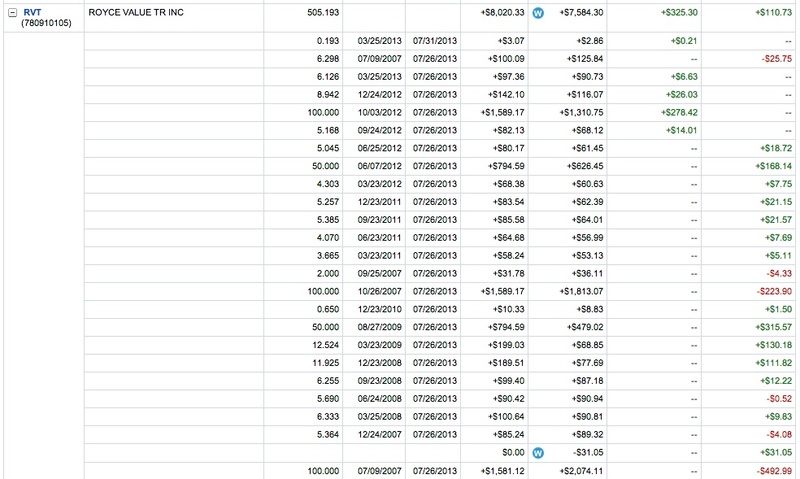 I am more likely to buy back the 50 shares in this account. I am not currently concerned about the issuer's credit risk. However, a pop over $25.5 and one more interest payment would likely cause this 50 share lot to disappear from the account. THGA was another ETB that was bought during the 2013 interest rate spike and quickly sold when rates started to decline in 2014.